Selected Science News: IS THE HOBBIT'S BRAIN UNFEASIBLY SMALL? 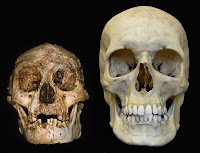 Homo floresiensis, a pygmy-sized small-brained hominin popularly known as 'the Hobbit' was discovered five years ago, but controversy continues over whether the small brain is actually due to a pathological condition. How can its tiny brain size be explained? Researchers writing in the open access journal BMC Biology have tackled this question in the context of a comprehensive assessment of the evolution of brain and body size throughout the larger primate family. Nick Mundy and Stephen Montgomery, from the Department of Zoology at Cambridge University, UK, and colleagues from Durham University used previously published data from living and extinct species to reconstruct the pattern of brain and body mass evolution in primates. According to Nick Mundy, "Our results provide robust confirmation for the suggestion that strong evolutionary trends have governed the expansion of the primate brain. In contrast, body size evolution has not tended to increase in primates, implying brain and body mass have been subject to separate selection pressures and supporting the findings of previous studies in other taxonomic groups that these two highly correlated traits can show differences in their patterns of evolution". Brain expansion began early in primate evolution and has occurred in all major groups, suggesting a strong selective advantage to increased brainpower in most primate lineages. Despite this overall trend, however, Mundy and his colleagues have identified several branches/lineages within each major group that have shown decreasing brain and body mass as they evolve, for example in marmosets and mouse lemurs. According to Mundy, "We find that, under reasonable assumptions, the reduction in brain size during the evolution of Homo floresiensis is not unusual in comparison to these other primates. Along with other recent studies on the effects of 'island dwarfism' in other mammals, these results support the hypothesis that the small brain of Homo floresiensis was adapted to local ecological conditions on Flores."